Is this a good result for the UFB top speed plan? Forums › New Zealand Broadband › Is this a good result for the UFB top speed plan? I am using a Asus RT AC66U router and my PC is a AMD Ryzen 3 2200. BigPipe advertises 700-900 download (so I am in the range) and 400-500 upload (again in range). Could I do better with a better router or should I be happy with this? 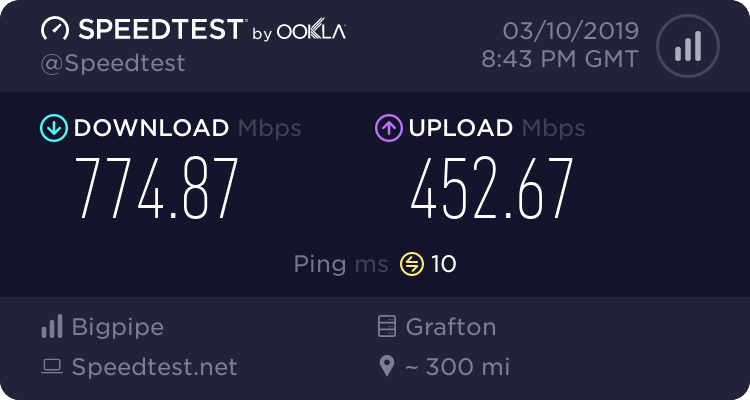 Certainly it's nice to have the fast speed but the effective difference between 200/20 and this is mainly in uploading - my cloud syncs run much faster. For movies etc. speed was never an issue for streaming on Netflix, Amazon Prime or Hulu since all of these are running off an Amazon Firestick 4K so it's wireless. You will probably never notice a slither of difference between 200Mbps plan and the one you got now for general web usage. It is literally bragging rights.. Maybe if you get some very well seeded torrents and have a raid 0 SSD array you will start to get some nice numbers..
10GBASE-T modem/ethernet will probably help to get closer to 1gig in perfect case scenarios. You will only get that speed in a perfect case as there are many more weak links in the chain. We have been in our home for 10 years now and fibre is FINALLY gonna be available in July ...so I would be so stoked with those speeds after 10 years of 20 - 30 Mb/s an ADSL and VDSL. I would try with the Windows 10 client rather than the browser. That speed is within the balpack that i'd say your getting full speed. Peak rate i would personally like to see a bit more, but there are oh so many variables that feed into that top rate outside of anything todo with the connection itself. It is literally bragging rights.. Context is key. Don't do what the herald does. Not really. Before UFB I was on TelstraClear and then Vodafone cable 100mbs plan so I am used to fairly decent Internet. But just wanted to make sure I was getting what I was paying for - not bragging.